Sandy beaches provide a natural barrier between the ocean and inland communities, ecosystems, and resources. However, these dynamic environments move and change in response to winds, waves, and currents. During an extreme storm, these changes can be substantial and sometimes catastrophic. High waves and storm surge act together to erode beaches and inundate low-lying lands, putting inland communities at risk. A decade of USGS research on storm-driven coastal change hazards has provided the data and modeling capabilities needed to identify areas of our coastline that are likely to experience extreme and potentially hazardous erosion during an extreme storm. The assessment methodology is based on a storm-impact scaling model that uses observations of beach morphology combined with sophisticated hydrodynamic models to predict how the coast will respond to the direct landfall of extreme storms. Storm-induced water levels, due to both surge and waves, are compared to beach and dune elevations to determine the probabilities of three types of coastal change (1) collision - occurs when the dune toe is eroded by waves and surge, (2) overwash - occurs when the sand is transported landward over the beach and dune by waves and surge, and (3) inundation - occurs when the beach and dune are completely and continuously submerged by surge and wave setup. As new beach morphology observations and storm predictions become available, the assessments will be updated to describe how coastal vulnerability to storms will vary in the future. 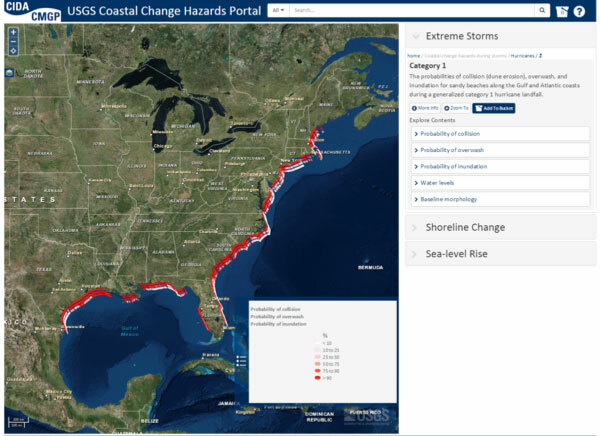 The National Assessment of Coastal Change Hazards Portal allows online access to the data and tools that enable users to apply coastal change hazard assessments to their specific needs. Hurricanes are tropical cyclones that form over tropical or subtropical waters in the North Atlantic Ocean, generally travel to the north, and can impact the United States along the Atlantic and Gulf Coasts. Hurricanes are categorized from 1 to 5 using the Saffir-Simpson Hurricane Wind Scale. A category 1 hurricane has wind speeds of 33 to 42 meters per second (m/s), while a category 5 hurricane has wind speeds greater than 70 m/s. Due to high wind speeds, hurricanes cause large waves and storm surge to impact the coast. Surge and waves from all categories of hurricanes can be expected to erode beaches and dunes and potentially overtop dunes to flood the area behind the dune. In general, lower dune elevations along the Gulf of Mexico and southeast Atlantic coasts make these regions more vulnerable to erosion hazards during hurricanes. Average dune elevations along the shores of the Gulf of Mexico are just 2.9 meters (m) high, making approximately 72% of these beaches very likely (probability > 90%) to experience extreme erosion due to overwash in the direct landfall of a category 1 storm. By contrast, dunes along the mid-Atlantic coast are, on average, over 2 m higher than dunes along the Gulf of Mexico coast and are less likely to experience overwash or inundation. In the mid-Atlantic, only 29% of the beaches are very likely (probability > 90%) to experience overwash in the direct landfall of a category 1 storm. However, this area also has the most variability in dune size and shape. This leads to a corresponding variability in the vulnerability of the beaches, placing areas highly likely to erode adjacent to more stable locations. The northeast Atlantic coast has the highest average dune elevation of 4.8 m, about 1 m higher than that in the southeast Atlantic. However, these two regions have very similar probabilities for coastal change because water levels in the northeast Atlantic tend to be nearly 1 m higher for category 1-4 storms. Another regional difference is found in the relative role of waves and storm surge in increasing coastal erosion vulnerability during low category hurricanes. Because surge is smaller in the Gulf of Mexico and southeast Atlantic regions, waves play a larger role in elevating shoreline water levels than they do in the mid- and northeast Atlantic. During a category 1 hurricane in the Gulf of Mexico or southeast Atlantic, the contribution of waves to storm-induced extreme water levels is nearly twice that of surge. Please note that Adobe Flash Player (version 11.1 or higher) is required for viewing the interactive map and can be downloaded here: http://get.adobe.com/flashplayer/. For a category 1 hurricane landfall, 99% of sandy beaches along the U.S. Gulf of Mexico coast are very likely to experience dune erosion, 72% are very likely to overwash, and 29% are very likely to inundate. For category 5 hurricane landfall, 98% of the U.S. Gulf of Mexico beaches are very likely to experience overwash and associated erosion, and 88% are very likely to be vulnerable to erosion due to inundation. During a category 1 hurricane landfall in the Gulf of Mexico, waves increase water levels at the shoreline, on average, by 190% above surge alone. The predicted wave-driven component of shoreline water levels was 3.12 m, high enough to erode the Gulf-coast averaged dune toe elevation (1.74 m) as well as overwash the average dune crest (2.9 m), even without surge. Hurricanes are not required for significant coastal change in the Gulf region. Waves and storm surge associated with tropical storms and winter cold fronts provide sufficient energy to put low-elevation beaches and dunes at risk to erosion. For category 1 hurricane landfall conditions, 89% of dune-backed beaches along the mid-Atlantic coast are very likely to experience dune erosion during the collision regime, 47% are very likely to overwash, and only 12% are very likely to inundate and experience erosion hazards that may include breaching. Greater extents of the southeast Atlantic coast are very likely to overwash due to the low dunes in the region. In South Carolina, which has not seen many landfalling storms in recent years, the average dune elevation is only 2.9 m, making this stretch of coast one of the most vulnerable areas along the Atlantic; 96% of the beaches are very likely to overwash in a category 1 hurricane. In a category 5 hurricane landfall, 92% of the southeast Atlantic beaches are very likely to experience overwash and associated erosion, and 75% of the beaches and dunes are vulnerable to erosion due to inundation. During a category 1 hurricane landfall in the southeast Atlantic, waves increase water level at the shoreline by 170% above surge alone. The predicted wave-driven component of shoreline water levels was 3.3 m, high enough to reach the mean dune toe elevation (2.3 m) even without surge. Post Hurricane Sandy, 75% of dune-backed beaches along the mid-Atlantic coast are very likely to experience dune erosion for a category 1 hurricane landfall, compared to 89% pre-storm. Hurricane Sandy eroded the dune face in many places, resulting in a higher dune toe elevation and a decreased likelihood of dune erosion. In other locations, the mean beach slope decreased, resulting in lower values for wave-induced water levels. For a category 4 hurricane landfall, 95% of the post-Sandy mid-Atlantic beaches are very likely to experience overwash, an increase of 3% over pre-storm. 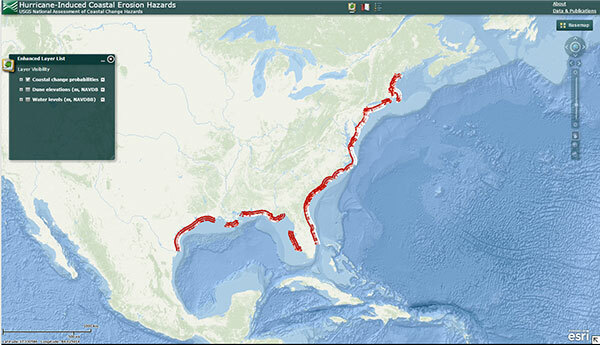 The fraction of coastline very likely to experience inundation also increased from 66 to 68% following Hurricane Sandy. Though hurricane landfall is rare along the northeast Atlantic coast, significant coastal change can occur in this region during such an event. Coastal elevations are higher here than in other areas along the Atlantic and Gulf coasts; however, the combination of steeper beach slopes with large waves and surges makes the northeast region vulnerable to substantial coastal erosion during storms. In the direct landfall of a category 1 hurricane, 97% of dune-backed beaches along the northeast Atlantic coast are very likely to experience dune erosion during the collision regime. Overwash during landfall of a category 1 hurricane is very likely along 52% of the sandy coastline in this region. During category 4 hurricane conditions, 82% of the northeast Atlantic sandy beaches are very likely to experience overwash and associated erosion, and 65% of the beaches and dunes are very likely to be vulnerable to erosion caused by inundation. Waves increase water levels by 140% over surge alone for a category 1 landfall. During category 4 conditions, waves only represent 43% of the extreme water level while surge makes up the remaining 57%. Roughly 30 kilometers (km) of the Massachusetts coast along the outer portion of Cape Cod is backed by tall bluffs, typically 10-50 m tall. The base of the bluff is susceptible to coastal change during all three erosion regimes, even though overwash and inundation of the bluff crest are not expected. Nor’easters are extratropical storms that often impact the mid- and northeast Atlantic coast of the United States, and are so named because winds hitting the coast come from a northeasterly direction. Nor’easters usually develop along the mid-Atlantic coast of the U.S. and move north or northeastward. While wind speeds during nor’easters generally don’t reach hurricane wind speeds (> 33 m/s), nor’easters are slower moving, affect the coast for a longer duration and can cause significant coastal change due to the frequency and duration of this type of storm event. For the purposes of this assessment, a classification system for storm strength is defined based on wind speed: here, a class 1 nor’easter has wind speeds ranging from 6 to 12 m/s, a class 2 nor’easter has wind speeds ranging from 12 to 18 m/s and a class 3 nor’easter has wind speeds in excess of 18 m/s. The mean dune elevation along the northeast Atlantic coast is 4.9 m compared to the mean dune elevation of 4.2 m in the mid-Atlantic. However, wave runup and surge tend to be about 50% higher along the northeast Atlantic coast than along the mid-Atlantic coast, leading to greater vulnerability to erosion due to collision and overwash. Wave runup is the dominant hydrodynamic process, comprising roughly 75% of the extreme water level at the coast for all 3 nor’easter classes. Inundation of dunes during nor’easters is very unlikely; even during the strongest class of storm, only 6% of the beaches and dunes along the mid- and northeast Atlantic coast are expected to flood. During a class 3 nor’easter, collision is expected along the majority of the coast and overwash is likely to occur for roughly a third of the coastline. Coastal elevations are higher here than along the mid-Atlantic coast; however, the combination of steeper beach slopes with large waves and surge makes the northeast region more vulnerable to substantial coastal erosion during storms. During the direct impact of a class 1 nor’easter the mean wave runup is 2.8 m and the mean surge is 1.6 m, leading to 70% and 12% of the coast very likely to experience collision and overwash, respectively. Collision and overwash are very likely along 95% and 45% of the coast during the direct impact of a class 3 nor’easter. The mean wave runup and surge for a class 3 nor’easter are 4.0 m and 2.2 m.
During a class 1 nor’easter, 31% and 8% of the mid-Atlantic coast is very likely to experience collision and overwash; wave runup and surge are 1.8 m and 1.0 m.
Wave runup and surge during a class 3 nor’easter are 2.6 m and 1.6 m, and 79% and 27% of the coast is very likely to experience collision and overwash, respectively. Research of forecasting the impact of storms on beaches along the US West Coast is currently on-going. See the West Coast Storms Research page for more detail.